The Elongated Crushblat (アシナガオトシ?, lit. : "Long Legged Dropper") is a passive enemy found in Hey! Pikmin, although it can crush Pikmin by accident. It is a relative of the Mockiwi that has extremely long legs, and despite the name, it is not related to the crushblat family. 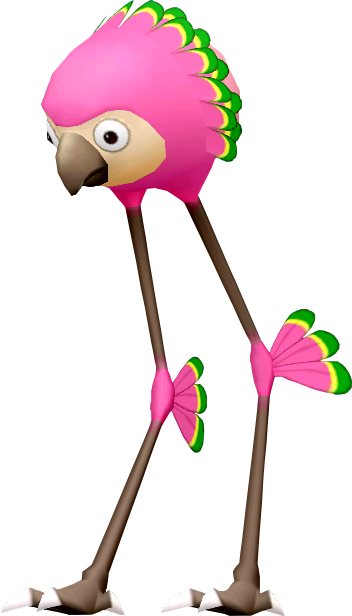 It also resembles a real-world flamingo, as it is a pink bird-like creature and even has similar-looking legs. Attached to the back of its knees are small feathers that can be attacked with Pikmin. This creature only appears once in the entire game, and it has a whole room dedicated to it; the camera even zooms out when this enemy is faced just so it can be better seen. 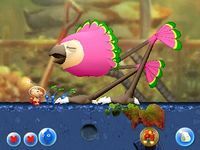 The Elongated Crushblat is a fairly slow, docile creature, that only kills Pikmin unintentionally, should they happen to be underneath its large feet when it takes its next step. It wanders forward left or right, stopping to turn around when it reaches the end of the room it's in, or when a Pikmin behind it is thrown at its joints. If it gets hit in the joints too much, its legs will go weak and it will topple to ground level. After a while, it will get right back up and continue its walk. Interestingly, while the player is underwater in the section below the creature's room, it's possible to see the Elongated Crushblat on the top screen, but it will be idling in place without ever walking, until Olimar actually gets close. Pollution Pool: The only Elongated Crushblat in the whole game appears here. The player must cross it in order to complete the stage, as Blue Pikmin are only found in its room, and the player can't turn back. Near the end of the area, where a bridge hast to be built, the player must dive into the water and enter a doorway on the rightmost part of the lake. This leads to a section where the player can climb up a vine on the left, and from there, fall into the room with the Elongated Crushblat. The creature, vulnerable after being toppled down. Particularly: Figure out exactly what triggers it to topple after the 10 hits have been reached while it's turning around. The Elongated Crushblat can only be taken out by throwing Pikmin at its knee-like joints. Pikmin thrown at the legs or feet will just bounce back, so you need the proper timing and angle to hit the joints. After hitting them 10 times, the creature will be weakened and come crashing down. At this point, it can be damaged properly by attacking its head. It will eventually shake the Pikmin off, so this may need to be repeated a couple of times. During its toppling animation, it is completely harmless, and touching the feet here will not cause damage or kill Pikmin. If you throw too many Pikmin while its foot is raised, you may find it hard to bring them back to you before the creature stomps, so don't throw too many. Bizarrely, if the 10th hit happens while the creature is turning around, you will need to hit the joints a few more times, but exactly how many times is not known. Alternatively, you can let Olimar touch one of the feet, which will make him lose some health, but will turn him and the Pikmin following him invincible for some seconds. Use this gap to run past the creature without defeating it or risking Pikmin deaths. You cannot get past this creature without taking damage – using the jetpack to go above the feet will still hurt you. The Elongated Crushblat walking around. This page was last edited on March 5, 2019, at 14:24.